The HD67146-A1 is Modbus Master / Modbus MultiSlave - Converter. The HD67146-A1 allows to interface some Modbus slave devices with two Modbus Masters simultaneously. This converter acts as splitter and it allows to interrogate the same Modbus slaves with two Masters without creating conflicts in the bus. In addition, it isolates electrically the Modbus sides between them. Internally to the converter, it is possible to configure a filter that allows to define which Modbus slave nodes will be accessible to each connected Modbus Master. 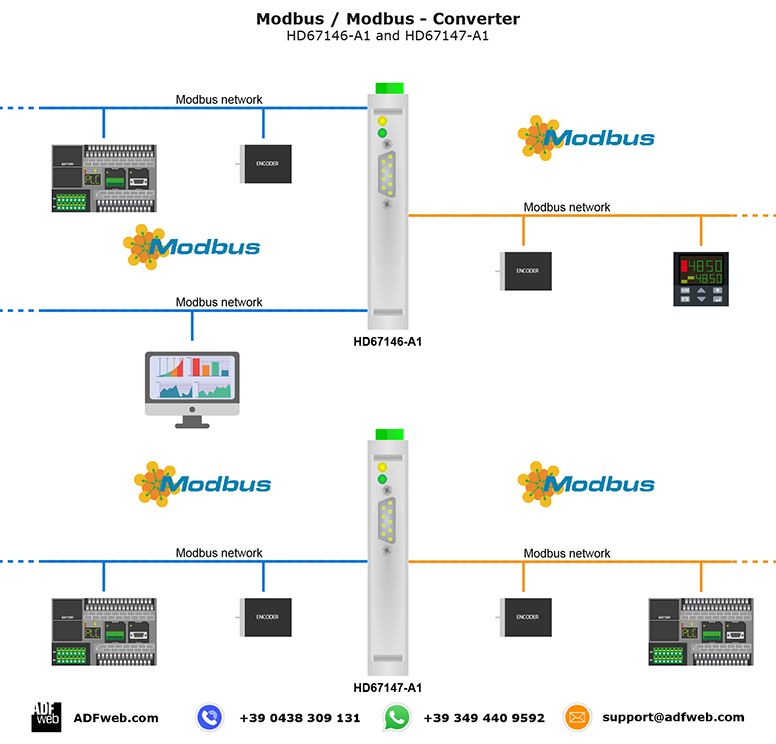 The HD67147-A1 is Modbus Slave / Modbus Slave - Converter, it allows to share informations between two Modbus Masters.